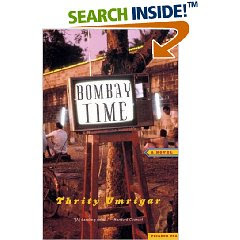 Bombay Time is Umrigar's debut novel and details the lives, loves and losses of a groupof people within a neighborhood/apartment complex in Bombay. All of the characters are middle aged and the book spends a lot of time in flashback mode (maybe a little too much, in my opinion). There's Rusi and his wife Coomi, who are dealing with a deteriorating marriage, Tehmi, a widow with a lifelong curse of bad breath (after breathing in the ashes of her dead husband), Soli, the joker with a broken heart, and a cast of others. Overall, it was a quick book..depressing at times, but when you're talking about slums, depression and the near deplorable conditions of Bombay, it's kind of hard not to feel for these people. But still, a good read.